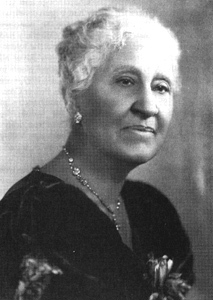 Founder of the National Association of Colored Women (NACW) in 1896, Mary Church Terrell was one of the leading twentieth-century African American women activists. For more than sixty-six years, she was an ardent champion of racial and gender equality. Born into the black elite of Memphis on September 23, 1863, she was the oldest child of Robert Reed Church and Louisa Ayers. While in school in Ohio she grew aware of discrimination and resolved to excel academically to prove the abilities of African Americans and especially black women. After graduation from Oberlin College in 1884 she took a teaching position at Wilberforce University in Ohio. A year later she was teaching at M Street High School in Washington, D.C. There she met her future husband, Robert H. Terrell. Between 1888 and 1896, she traveled throughout Europe. In 1896 Terrell returned to the United States as an advocate of racial elevation. In the same year, she became the founder and first president of the NACW. Symbolizing unity among black women, this self-help organization offered sisterly support for its members and created programs that addressed racial problems through the elevation of black women. Terrell equated the struggle for the amelioration of discrimination with the elevation of black women. Terrell led the NACW in establishing socially progressive institutions such as kindergartens, day nurseries, and Mother Clubs. Mother Clubs functioned as depositories and disseminators of information on rearing children and managing the home. Terrell’s objective was to improve the moral standards of the poor and poorly educated, since she believed that the world judged the race through its women. From 1896 to 1901 Terrell defined and developed her role as a “New Woman,” which resulted in the development of purpose, independence, and vitality in her life. By 1901 Terrell began to move from an approach of black self-help to one of interracial tolerance, advocating education as the way to understanding. She hoped that unbiased research and intelligent dissemination of information to both whites and blacks would promote better cooperation. Terrell’s advocacy of African American women led to opportunities to comment on broader issues facing her race. She made many speeches on the living conditions of African Americans and highlighted their progress in spite of discrimination. In a stirring address delivered in 1904 at the International Congress of Women in Berlin, she vividly described the numerous contributions of African Americans. She delivered the speech in German (she spoke three languages fluently), receiving accolades for her depictions of African American life and her intellectual abilities. Her speeches acted as morale boosters for African Americans, even as she exhorted them toward self-improvement. Terrell also wrote articles and short stories on lynching, chain gangs, the peonage system, defection of mulattoes, and the disfranchisement of African Americans. In her writings, she sought to further interracial understanding by educating whites about the realities of African American lives. The last two decades of her life marked a transition in her position on race relations and politics. Frustrated by the economic hardships of African Americans during the Great Depression and New Deal era, dismayed by the irony that African Americans were fighting for the democracy abroad that they were denied at home, and grieved by the death of her husband, Terrell became a militant activist, working assiduously to bring a definitive end to discrimination in the United States, particularly in the nation’s capital. In her later life, Terrell led a three-year struggle to reinstate Reconstruction-era laws that prohibited racial segregation in public eating facilities in Washington, D.C. These antisegregation laws had disappeared in the 1890s when the District code was written. On February 28, 1950, Terrell, accompanied by one white and two black collaborators, entered Thompson Restaurant; they were refused service. Terrell and her cohorts filed affidavits, and District of Columbia v. John Thompson became a national symbol against segregation in the United States. Her direct-action tactics of picketing, boycotting, and sit-ins proved successful, and on June 8, 1953, the court ruled that segregated eating establishments in Washington, D.C., were unconstitutional. This ardent fighter for civil rights lived to see the U.S. Supreme Court mandate the desegregation of public schools in Brown v. Board of Education. Two months later, on July 24, 1954, she died.